Shadowshaper seems to be most often compared to Cassandra Clare’s Mortal Instruments, but it’s a terrible comparison. In fact, there is no comparison to be made that isn’t entirely superficial. Shadowshaper isn’t a flawless piece of work, but it’s not a mess of derivative, hackneyed tropes like the Mortal Instruments series was, either. Yes, Shadowshaper also takes place in New York, but where Clare’s series was generic and poorly researched, Older’s book is set in the Bedford-Stuyvesant neighborhood that he resides in himself and has a strong sense of place that helps to draw the reader into the world he’s created. 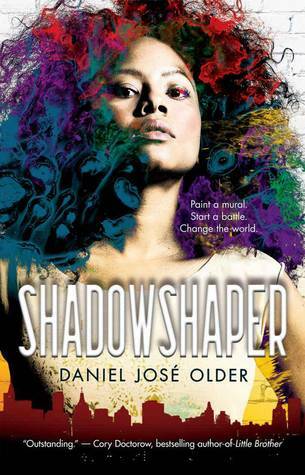 Yes, Shadowshaper also has a teenage girl protagonist whose story starts when she begins seeing weird stuff and finds out she has magical powers, but where Clare’s Clary Fray is a bland cipher upon which the reader can self-project fairly freely, Older’s Sierra Santiago has a vibrant personality and a specific identity that invites the reader to share and understand her but not to become her. While Sierra has plenty of likable traits–she’s clever and brave and kind, for example–there are many things about her that I don’t expect will be universally relatable. As a white reader, I appreciate the gift that Older offers me–a tiny window into an experience of the world very different from my own–and I can only imagine how gratifying it must be for young people who share more of Sierra’s experiences to discover this book in libraries and bookstores that are far too full of characters like Clary Fray. Yes, like Clary Fray, Sierra has a group of friends who help her fight the forces of darkness, but where Cassandra Clare’s Shadowhunters are a group thrown together by the most boring sort of destiny ever (and often don’t even seem to like each other), Sierra’s friend group in Shadowshaper is made up of people who are part of a community, and that community is really the whole point of the book. It feels real and organic, and the emotional payoffs, for the most part, feel earned. Shadowshaper even has romance, but it doesn’t take over the novel, and it develops sensibly; at the end of the book, I felt like Sierra and Robbie were embarking on an exciting new part of their lives, but not as if everything was settled before the characters even graduated high school. I always appreciate when authors do YA romance without turning it into some sort of star-crossed, destined, One True Love situation. Young love deserves to be treated seriously, and teenagers’ emotions are deep and strong, but we seldom meet The One at that age. I tend to enjoy YA romance much more when authors keep it in perspective, and Older has done a nice job with it here, creating a heroine who likes a boy but doesn’t waste too much time overthinking the situation. Sierra has more important things to deal with, after all. I would have liked this book to spend more time with Sierra’s mother, who I think is interesting enough to carry a book of her own. I felt like Maria’s change of heart about shadowshaping at the end of the book felt abrupt and more driven by what the author wanted to happen and how he wanted to end things than it was by anything that would normally have naturally happened with these characters. I understand wanting to write the happiest possible ending, but the way that this happens felt pretty inexplicable to me. The shadowshaping magic itself was on the one hand really interesting, but on the other hand slightly nonsensical. It’s not exactly clear what this magic is capable of, and some of the descriptions of the magic Sierra works are confusing. One of the reasons I read this book in the first place was that it promised Caribbean magic. While I think it does a good job of capturing the sense that shadowshaping is specific to the culture depicted in the book, it’s on a bit more shaky ground when compared to other fantasy magic systems (but still worlds better than anything Cassandra Clare has written). Shadowshaper is an excellent read overall, though. It’s fast-paced, and I had a hard time putting it down because I always wanted to know what happened next. While its flaws aren’t inconsiderable, I think they are more than made up for by its strengths–namely, it’s beautifully crafted setting and a delightfully plucky heroine. Also, it’s got an absolutely gorgeous cover. This book sounds great, it’s not common to see YA with a POC protagonist and this setting sounds very unique – I’m intrigued! I didn’t like TMI so the fact that it’s not similar also reassures me. Fantastic and very thorough review, thanks for sharing your thoughts.